Reynolds Funeral Home announces with deepest sympathy the passing of Mr. James C. McDaniel, 74 of Moulton, Alabama. Mr. McDaniel passed away on September 13, 2018 at his residence. A Celebration of Life Service will be held on Monday, September 17, 2018, 12 Noon at Byler Road Church of Christ with Brother Robert Monroe, officiating and burial in Moulton Memory Garden. Public viewing will be Sunday from 2:00 p.m - 6:00 p.m. at Reynolds Funeral Home. James Carlin McDaniel was born to the late Armintha McDaniel and Henry McDaniel May 30, 1944 in Moulton, Alabama. James was a member of Byler Road Church of Christ in Moulton, Alabama. 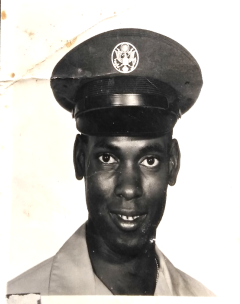 James was a Vietnam Veteran in the United States Air force which he received honorable discharge. He retired from Wayne Farms, LLC. James was preceded in death by his sister, Ruby B Moore; brothers, Florence Edward Webb, George Ross Webb, Allen Crawford Webb; one granddaughter, Kiara Pruitt. He leaves to cherish his memory: a loving devoted wife of 50 years, Bertha Nell McDaniel; five children, Felecia Boyd, James (Wheat) McDaniel Jr., Tammy McDaniel and Bianca Stanley of Moulton, AL; Shelia McDaniel of Athens, AL; three sisters, Audrey Hamilton of Moulton, AL; Alice Faye Lee (David Clayton) of Moulton, AL; Burnestine McDaniel of Louisville, KY; one brother, Tony Webb of Decatur, AL; five sisters-in-law, Jorene Webb of Moulton, AL; Jacqueline Webb of Moulton, AL; Hattie McDaniel and Purfice Boyd of Moulton, AL; Rosemary Webb of Decatur, AL; one brother-in-law, Willie Gene Boyd, of Moulton, AL; 12 grandchildren, nine great-grandchildren, and a host of nieces, nephews, cousins, and friends.